Please contact Father Dan Viertel directly to arrange a date for your wedding and marriage preparation! Marriage is the center of Catholic family life and the vocation through which most people live out their baptismal commitment. The Church rejoices with you as you approach the sacrament of marriage and wishes to support you in living your married life to the fullest. Cultural influences today can work against personal development for healthy Christian marriage and a lifetime commitment. The Catholic Church wants your marriage to succeed and offers you the building blocks with which to build a solid foundation for your marriage. The cornerstones begin now, during your engagement. Our Diocese offers key steps of proven, effective and successful marriage preparation to engaged couples in order to prepare them for entering and living out the sacrament of marriage. Among the key elements are an assessment of your strengths and weaknesses, both as individuals and as a couple, and good formation based on strong educational programs on the sacrament of matrimony. Our Diocesan marriage preparation process, the steps of which you will be provided, will give you the spiritual resources and practical tools you need for a strong and healthy marriage, not only as newly married, but for a lifetime. 3rd & 4th Weekends in Feb. Wedding Services - are celebrated on Saturday. The latest service time is 1:30p.m. Rehearsal Service - are scheduled for Friday evening at 5:30 the day before the ceremony. No wedding date is confirmed until the first meeting with the pastor at which time the church stipend is collected. For Registered Members: - $75 church stipend. 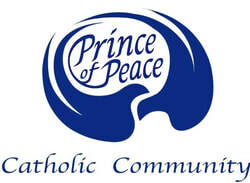 This applies to Prince of Peace registered parish members demonstrating an active, participatory and contributing membership for at least one year. Children of registered parish members are included. Non-Parish Members: - $75 + an additional $225 facility use fee for a total of $300. Priest Stipend: $50 - $100. Now that you are formally engaged the date has been set and the church reserved, it is important that you begin your preparation for this special Sacrament as soon as possible. The marriage preparation process consists of the following. Initial interview meeting with father, with two subsequent follow up meetings. Completion of the “Foccus” inventory with an assigned “Foccus” couple. Please contact Father at your earliest convenience at fatherdan@popgb.org.